Unique, Energetic and Dynamic Electric String Quartet. The Siren String Quartet is a unique, Energetic and Dynamic Female Electric String Quartet featuring four of London’s Top String Musicians. Graduates of the Royal Academy and Royal College of Music in London, The Siren String Quartet are in demand throughout the world. Recent performances include their electric crossover show as the headline act for the Sheiks in Dubai and backing P Diddy for his performance on A Concert For Diana. They spent the summer of 2006 performing with Gnarls Barkley on his European Tour, including the O2 Wireless Festival in London, the Montreaux Jazz Festival, the Hurricane Festival and the Fuji Rock Festival in Japan. Siren also performed with Gnarls on BBC1’s Later With Jools Holland, Channel 4’s T4 Special, BBC Radio 1 and a record 9 weeks in a row on Top of the Pops with Gnarls’ no 1 hit ‘Crazy’. Siren embarked on a second tour with Gnarls Barkley towards the end of 2007. Siren have performed the opening and closing shows for the Professional European 2008 Golf Championships on the Island of Cheju in South Korea and performed at La Dolce Vita Ball in London supporting singing legend Billy Ocean. Siren have also performed with Alfie Boe, Mika, Mutya, Michael Buble and Hard Fi, featured as the strings in Mark Ronson’s video ‘Valerie’ and recorded with The Killers, Brand New Heavies and Dutch X factor winner Lisa Hordijk. Siren have also completed a European tour as part of Simply Red’s string section and performed in all of the major venues in the UK and much of Europe. 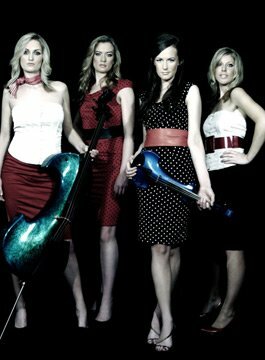 The Siren Electric String Quartet is perfect for corporate events. They can perform a sophisticated background set during dinner which includes light classical and popular standards creating a classy ambience enabling guests talk and dine. At the end of dinner they change costumes and return with an explosive audience grabbing 20 minute set. This is performed with all the girls stood up and incorporates exciting choreography and specially written backing tracks featuring drums and guitar. This set is perfect for changing the room from a relaxed atmosphere over dinner to raise the temperature ready for a party or to build anticipation prior to an exciting awards presentation or performance by a named artiste. Siren can be booked to perform a classical dinner set as background music, or the dynamic Siren Electric Show on its own. However, we would recommend that booking both shows allows you to deliver the element of surprise with the second set really raising the temperature bringing the audience to its feet, with stylish choreography and a performance that is packed with energy. "..they punch the air with their bows and perform formation seated dances when they're not playing flourishes.."
"(Gnarls Barkley's) string section look particularly fine, St Trinian's style, even managing to perform perfectly synchronised dance routines from their seats, shimmying with their bows.."
"...a string quartet who start demure and soon turn demented"